This second edition of An Environmental History of the World continues to present a concise history, from ancient to modern times, of the interactions between human societies and the natural environment, including the other forms of life that inhabit our planet. Throughout their evolutionary history, humans have affected the natural environment, sometimes with a promise of sustainable balance, but also in a destructive manner. 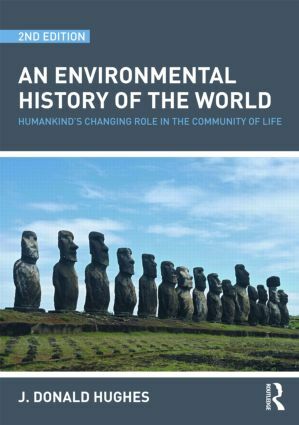 This book investigates the ways in which environmental changes, often the result of human actions, have caused historical trends in human societies. This process has happened in every historical period and in every part of the inhabited earth. The book is organized into ten chapters. The main chapters follow a chronological path through the history of mankind, in relationship to ecosystems around the world. The first explains what environmental history is, and argues for its importance in understanding the present state of the world's ecological problems. Chapters two through eight form the core of the historical analysis, each concentrating on a major period of human history (pre-civilized, early civilizations, classical, medieval, early modern, early and later twentieth century, and contemporary) that has been characterized by large-scale changes in the relationship between human societies and the biosphere, and each gives several case studies that illustrate significant patterns occurring at that time. The chapters covering contemporary times discuss the physical impacts of the huge growth in population and technology, and the human responses to these problems. Our moral obligations to nature and how we can achieve a sustainable balance between technology and the environment are also considered. This revised second edition takes account of new research and the course of history containing new sections on global warming, the response of New Orleans to the hurricanes Katrina and Rita, and the experience of the Dutch people in protecting their low-lying lands against the encroachments of rivers, lakes, and the North Sea. New material is also offered on the Pacific Islands, including the famous case of Easter Island. This is an original work that reaches further than other environmental histories. Rather than looking at humans and the environment as separate entities, this book places humans within the community of life. The relationship between environmental thought and actions, and their evolution, is discussed throughout. Little environmental or historical knowledge is assumed from the reader in this introduction to environmental history. We cannot reach a useful understanding of modern environmental problems without the aid of perspective provided by environmental history, with its illustrations of the ways in which past decisions helped or hindered the interaction between nature and culture. This book will be influential and timely to all interested in or researching the world in which we live.